Hillsboro, OR. 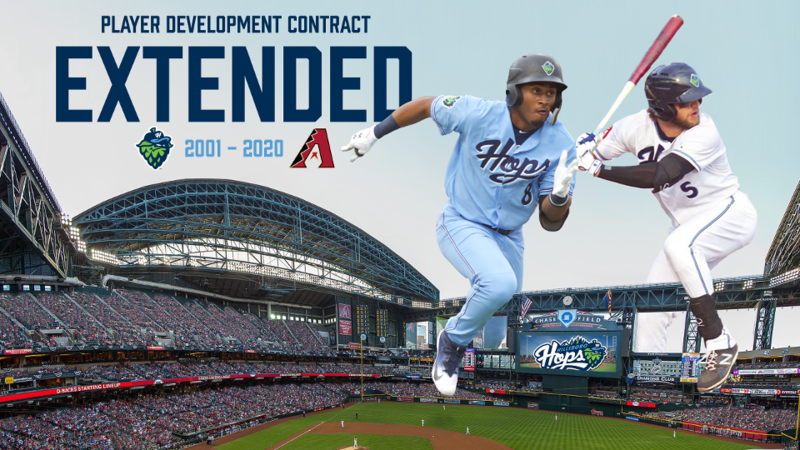 (July 13, 2018) - The Hillsboro Hops (@HillsboroHops) and Arizona Diamondbacks (@Dbacks) extended their working agreement through the 2020 season, it was announced by both clubs on Friday. The two-year extension takes the D-backs affiliation with the Hops and their predecessor, the Yakima Bears, to 20 seasons (2001-2020). "The Arizona Diamondbacks are excited to extend our relationship with the Hillsboro Hops," said D-backs Executive Vice President and General Manager, Mike Hazen. "Mike and Laura McMurray and KL Wombacher have built a first-class organization that we're proud to be affiliated with. The support from the Hillsboro community is unrivaled in Minor League Baseball, and it is an excellent starting point for many of our young players." "We are thrilled to extend our affiliation with the Hops," said Mike Bell, the Diamondbacks' vice-president of player development. "It is an amazing place for young minor league players to develop. [Hops owners] Mike and Laura McMurray along with K.L. Wombacher and the entire Hops staff treat our young players to a major league experience they will never forget. The community and fan base of Hillsboro is the best in all the minor leagues." Since the Hops came into existence in 2013 when the club moved from Yakima to Hillsboro, they have far and away the best record in the Northwest League --- more than 20 games better than the next-best club --- and they won back-to-back league championships in 2014 and 2015. If the Hops make the playoffs this year, they would tie the NWL record with five consecutive postseason berths. "The Diamondbacks have been tremendous partners and friends of our organization," said K.L. Wombacher, Hops president & general manager. "We are proud to be part of their family and we take our role in the player development process very seriously. We appreciate the work of Mike Bell and the player development staff to provide us with competitive teams each season, and we appreciate all the great coaches we've had in our time with the D-backs. We couldn't be happier to extend this partnership to 2020, and we hope it continues well into the future." Eight former Hops have gone on to play in the major leagues: Aaron Blair, Daniel Palka, Jimmie Sherfy and Braden Shipley (all of whom were with the Hops in 2013); Zac Curtis and Brad Keller (2014); and Dansby Swanson and Mike Freeman (2015). In addition, four players with previous major league experience have also played for the Hops: Matt Koch (a Hop in 2017), Randall Delgado (2017), Brian Ellington (2018) and Henry Owens (2018). Other former Hops' big-league debuts seem imminent, such as Kevin Cron (2014) and Taylor Clarke (2015), who are having strong seasons this year at Triple-A Reno. Entering play on Friday, Hillsboro (19-8) has the best record in the Northwest League, and a four-game lead in the South Division on both Boise and Salem-Keizer. There are 11 games remaining in the first-half pennant race, and the regular season continues through Sept. 3.